Solar Impulse, the fuel-less plane, is on the way ,on its epic attempt to be the first ever plane to fly around the world on solar power alone. The journey will take an estimated 25 days of flying, over a five month period and, during that time, the plane will be flown at night, as well as in the day. The plane may only fly at 60 miles per hour and only carry one person, but this really will go down in the aviation history books as a milestone to be remembered. Here are ten fascinating facts about Solar Impulse 2. Solar Impulse 2 is a lightweight plane built is carbon fibre. 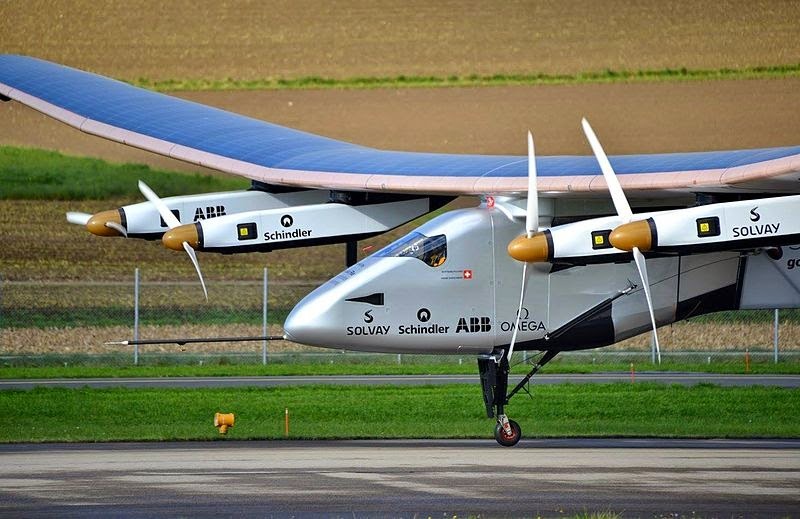 Its only source of power is it’s 17,248 solar panels that are built into the wings and an array of lithium polymer batteries that provide the aircraft with the energy it needs to fly at night. The wing span of Solar Impulse 2 is 236 feet, which is larger than that of a jumbo jet. The aircraft only weighs, though, 2,300 kilograms, which is about the same as an average family car. The large wingspan and light weight are one of the reasons that it can fly on so little power. The two pilots of Solar Impulse 2, Andre Borschberg and Bertrand Piccard will share the flying time. Some legs of the fight will mean that a single pilot will be in the cockpit for five continuous days and nights. The seat in the cockpit of Solar Impulse 2 has to serve many purposes. With its ingenuous, lightweight, design the aeroplane seat includes a parachute and life raft, packed into the back of the seat, and when fully reclined, it can be used as bed and it even allows the pilot to do some exercising. The other vital component in the seat, for the extended flying periods, is a toilet. The cockpit has been lined with special thermal foam to help control temperatures because there is no heating or air-conditioning on Solar Impulse 2. The pilots could face temperatures extremes of anything between +40°C to -40°C. For the technically curious, here are some of the stats the stats for Solar Impulse 2. Take off within only 165 yards (150 m) approx. After its first leg, from Abu Dhabi to Oman, Solar Impulse 2 will make its way to India, followed by China and Myanmar. It will then fly across the Pacific, stopping in Hawaii, on its way to Phoenix, Arizona. Then, it’s on to JFK airport in New York, followed by a flight across the Atlantic. The destination of the Atlantic Ocean leg will depend on the weather in the region at the time and it could be either; southern Europe, or North Africa, after it which, it will continue on its way back to Abu Dhabi. Bertrand Piccard and André Borschberg say they are not trying to drastically revolutionise air travel, but they are trying to raise awareness of things that people thought, previously, were impossible to do with renewable resources. They set out to increase people’s belief in the possibilities of non-fossil fuel energy solutions, and, they are certainly achieving their aim, with this amazing feat of engineering and human endurance. Good to luck to both of them and to their team.